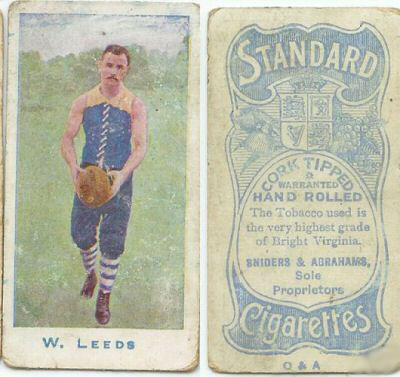 Although he only played 27 games for Carlton in three seasons, Billy Leeds holds a unique place in the history of Australian Football. In 1904 he retired as a player to become an umpire. But Carlton, beset by injuries, convinced him to return for that year's finals. Playing on a half-back flank, Leeds was prominent across half-back in the Blues' 3-point Semi Final win over Essendon. Then a fortnight later, he was part of the first Carlton team to contest a VFL Grand Final, when the Blues were well-beaten by Fitzroy. Billy therefore became the only man ever to umpire a VFL game - and play in a Grand Final - in the same year. 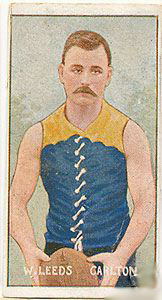 Leeds was born in Carlton, and recruited from Brunswick to the Blues. He passed away on the 6th April, 1955, aged 75. Contributors to this page: molsey , PatsFitztrick , Bombasheldon , Jarusa , tmd1 and admin . Page last modified on Saturday 14 of April, 2012 09:53:23 AEST by molsey. 1985 Rd 14 - Justin Madden wins another hit-out.